Ex-Scottish Borders Council leader David Parker, former Mid Berwickshire councillor Frances Renton and Nile Istephan, chief executive of Eildon Housing Association, at the former Earlston High School site in 2017. Planning consent is now being sought to build 64 affordable homes in a Borders town. The £9.2m development, first announced in February 2017, is earmarked for the former Earlston High School site. During a public consultation process over the plans, concerns were raised that the main road through Earlston would struggle to cope with such a large-scale development. Part-funded by a £5.2m social housing grant from the Scottish Government, it would be made up of a mix of two, three and four-bedroom homes. Unease was also expressed about the loss of green space in the village as the school’s former playing fields would be built over. However, the application, submitted by Edinburgh-based Hart Builders on behalf of Eildon Housing Association, commits to creating a new riverside walk by way of compensation. Scottish Borders Council also has plans for an adjacent field to be turned into a park. The land earmarked for the homes has been lying empty since the current Earlston High School at East End opened in 2010. Part of the old high school site is now occupied by the £1.6m Leader Valley School for children with additional learning needs, opened in 2017. A report submitted to the council by the design team at Aitken Turnbull Architects’ Galashiels office says: “The layout has been designed to provide natural traffic calming through the geometry of the streets which has a pedestrian focus. “The routes through the development are designed to be deliberately circuitous which will discourage vehicles passing through the development as a casual short cut. 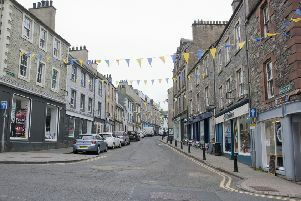 “Concerns were raised at the general level of traffic on the high street. It is noted that the development is zoned for housing so this is largely out of control of the applicant. “As a response to the community concerns to the loss of informal paths that cross the school playing field, it is proposed that part of the development is to facilitate the creation of a river walk along the Turfford Burn. “An informal footpath will be created along the burn which borders the southern boundary of the site and in future will connect into the proposed park to the east.